SuperBeacon™ Beta-Blocker CQR™ - Crystal Quantum Radio™ device by E.J. Gold. Use with Beacon™ Inductions to facilitate and chart your progress in connecting with your parallel world identities, experiences, lifetimes and to enhance your lucid dreaming and other out of body voyages. The Super Beacon can be used with your Ancient Coins and Antiquities to facilitate the psychic connections for psychometry or reading of past life objects. 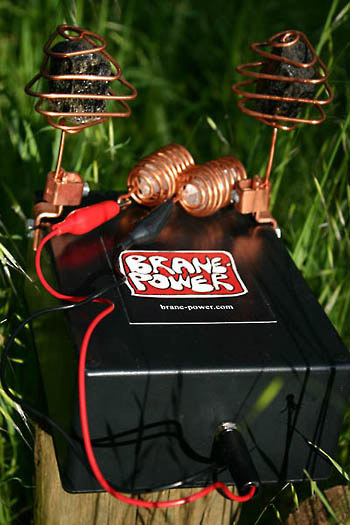 The SuperBeacon is a highly modified crystal radio connected to a pair of copper-wrapped quartz crystals. The crystal controllers are attached to the connecting cord with covered alligator clips. Should they become disconnected, simply clip them and pull the plastic covers down over the clip for comfort and aesthetic. The crystal controllers are held, one in each hand. It does not matter which cord is left and which is right -- plus and minus orientation is not important unless you are training on higher levels, in which case the black cord goes to the left hand and the red/yellow cord goes to the right hand for meridian balance. Because the crystal radio circuit derives all its power from the radio waves themselves, there is virtually no current running through the body except what normally comes through broadcast radio waves in Earth's atmosphere. The stronger SuperBeacon™ Auto-mapper Beta Blocker helps you link up with your past, present and future lives like the regular Beacon™ AND offers the black tourmaline cleanser-charger. Broadcast radio waves in the AM band have several sources; man-made "intentional" waves, Earth's magnetic field and stellar radio waves, including those from the closest star, the sun. Magnetism and electricity are the co-related forces, hence the measurable and detectable field which they generate is called the Electro-Magnetic Spectrum. The SuperBeacon is primarily a focus point for psychic-intuitive energies, a crossroad through which very subtle energies pass and are brought into relationship with one another through a coupling factor of sensitivity and selectivity. The Germanium crystal is called "detector", but what it actually does is separate the AC -- Alternating Current -- of the radio waves into DC -- Direct Currents, which can then be processed by the remainder of the radio circuit. You may feel a bit of a tingle when holding the controllers, not from any measurable voltage, but from the crystal energies themselves, enhanced by the copper wrappings and their connection to the radio-waves processed within the SuperBeacon's crystal technology processor. Place the crystal controllers on the table in front of you. All lower level procedures are intended in the seated position, but if you prefer, you can lie down and close your eyes if you are using a SuperBeacon at home or in higher level procedures. Put the Sony headphones on -- you will note that they are oriented with an "L" for the left ear and "R" for the right ear. You may prefer to use ear buds, or another high quality headphone, which is just fine. Everyone is required to use their own headphone unit at a training center for the sake of personal hygiene and also for psychic-spiritual cleanliness. The induction disk should now be placed in the Walkman CD player. Do not use an MP3 or copied disk for this purpose. The disk itself is "charged" shamanically and is an important part of the functionality of the SuperBeacon. Later, more advanced training will not use CD induction. Relax as much as you are easily able to do at this time and drop the facial mask by relaxing the facial muscles. Release any tension in the shoulders and breathe normally, naturally and gently to get the best results, however if you are feeling tense, it's all right -- the tension will be gone by the end of the induction. Start the disk by pressing the "play" button to the right of the little window on the side of the Walkman. Adjust the volume as necessary with the "plus" and "minus" buttons to the left of the little LCD window. Pick up the crystal controllers and allow the induction to do all the work. Don't worry if the Chronic fights the procedure -- it works anyway. When the induction is complete, which at lower levels will be in about ten minutes and in advanced procedures will be up to an hour, you can place the controllers back on the table and remove the headphones or ear buds. You can continue to hold the controllers for simple Beta-Block if you like. You should never do more than one Parallel Universe Persona Training per day, but you can use the SuperBeacon as often as you like for as many hours as you like for other purposes from beta-block to Alpha-Theta Inductions, Zone Box Inductions, which you can use at the Brane-Power Training Center or purchase for home use online at www.yoyodyneindustries.com. "Feeling very carefree and worryless from the Beacon inductions. Also, the Zone-Box inductions, the double-black and the El Brujo are helping - it's hard to isolate the effects of one thing. But if I were to guess, I would say that the Beacon inductions are the most powerful of all. So we can publish it using only your initials for the benefit of others. But this is not a requirement, just a request. There may be some very pronounced psychic-spiritual effects immediately following the training, including a feeling of being "high" or intoxicated. If so, do not attempt to drive or operate heavy machinery until this effect has passed. It usually lasts only a few minutes, but can continue for longer, in some cases, where the trainee is highly spiritually sensitized and has had shamanic training or psychic-medium experiences. The actual effect of the training may not reveal itself until later, when a skill or ability presents itself which was not learned in this lifetime track, but was learned by a different Parallel Universe Persona on a different life-track. The immediate effect will vary from individual to individual, and from one training level to the next, but the cumulative effect will be to "cluster" many Parallel Universe Personae into one highly charged and super powered personal manifestation of a single unified higher self, called the Essential Self, the spiritual director of your personal manifestation in the Home World Universe. If you have any questions about the SuperBeacon, you can email me through the Brane-Power.com website or through yoyodyneindustries.com. For pure theory, you can read my book on Brane-Power technology which you will find on the front page of yoyodyneindustries.com, "Parallel Worlds Explored". But please remember that in the field of physics, everything is speculation -- even what has been "proven" by technical math "proofs" and lab results will change as we learn more. It has been said that today's magic is tomorrow's science and that today's science is yesterday's magic. My SuperBeacon and Beta-Block spirit guides are by those standards, 90% magic and 10% science. I think you will be pleased with the results -- fully energized and present with full attention, ready for life and all its surprises, ready for passage into other dimensions with eyes wide open and a childlike sense of thrill and wonder. It is not, nor was it ever, intended for the prevention, diagnosis or treatment of any diseases, whether physical, emotional or mental. You will receive a FREE, "Parallel Worlds Explored" with the purchase of your Super Beacon.